Global Trading (GTL), a Euro Pacific Bank company and online multi-asset trading and investment brokerage firm, now provides Stock Options trading on its platform for retail and institutional investors. As investors are seeking more diversity in asset classes, instruments and financial services, we have built a flexible solution which caters both to the retail and institutional market segments, enabling our clients to trade equity options in a way that best enhances their individual investment strategies. We consistently strive to provide a platform that is streamlined, efficient, and provides the tools and functionality to give our clients a competitive edge in the multi-asset arena. The addition of equity options to our platform marks an important step in this ongoing development of the GTL proposition, particularly at a time when appetite for this particular instrument is on the rise. 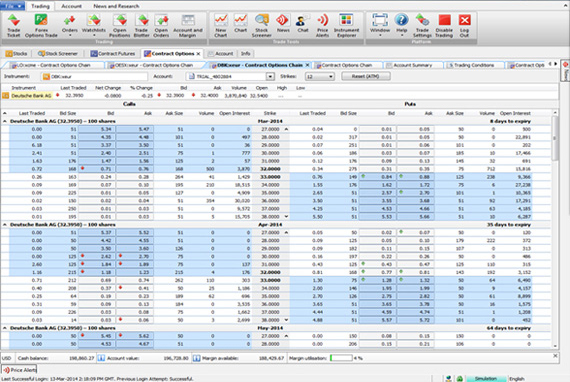 Stock options are tradable from our industry-standard options chain in the TradeStation and WebTrader platforms. GTL will initially provide direct access to the 150 most liquid US stock options. Over time, GTL will expand its offering. Real-time monitoring of your positions through Global Trading’s online investment platforms. Limit, Stop and Market orders will be supported. Both One-Cancels-Other (OCO) and Good-Till-Canceled (GTC) parameters are available.